WhatsApp is again in news but this time not for any security holes, but for its all new and, of course, much-awaited Free Voice Calling feature — similar to other instant messaging apps like Skype and Viber allow users to make voice calls using Internet. After launching its much-awaited Web client (dubbed WhatsApp Web) to Android users, the most popular mobile messaging application WhatsApp has started rolling out the promised free voice calling feature, and this time again to Android users first. 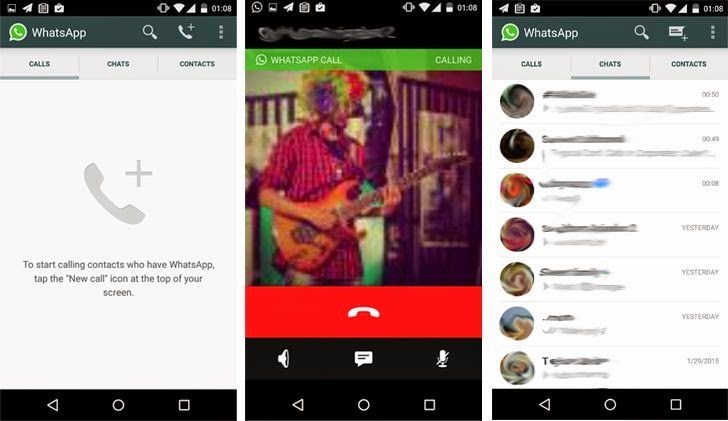 Late last night, some screenshots of WhatsApp's new voice calling feature appeared on Reddit. Reportedly, this new feature will allow WhatsApp users to make free voice calls to their online pals by simply tapping your phone icon to call their WhatsApp friends. The report broke when a Reddit user (pradnesh07) received a WhatsApp call from a friend, and this is how the feature get activated. The free voice calling feature, for now, seems to be invite-only. So, if you still have to wait for a WhatsApp call from one of your friend with the feature already activated, in order to enjoy free voice calling on WhatsApp. "Its like an invite thing, where a person with the call feature needs to 'call' another person who wants to start using the feature," said Reddit user pradnesh07. "You need to get the APK from the website and not from the Play store." Reddit user also noted that WhatsApp free voice calling feature only appears to work for people running the latest WhatsApp app version for Android on a Google Nexus 5 phone running the latest Android 5.0.1 Lollipop. The world's most popular messaging application WhatsApp first announced plans for free voice calling support in February last year. So far, it's not clear how many WhatsApp users have access to the updated user interface with free voice calling feature. But we hope that the feature will be soon rolled out for all WhatsApp users and will be there on your devices too.